How is Sea Glass Made? Woodland Beach, Smyrna, Delaware, USA. Found lots of pieces many sizes. Tiny Beach, I have been told not safe if alone, we had no problem in daytime. Under the hot summer sun, vacationers stroll the Rehoboth Beach boardwalk, chewing saltwater taffy and listening to the gulls raucous cackle. Few realize that under the sparkling water rests a graveyard. Elaine B. - Can you post a picture of the piece? Elaine - can you please post a picture of your amazing find? We would love to see it! The sea glass show was fun. I was there, too! We visited Woodland Beach this past weekend to look for sea glass. Brought our daughter along also, so this was her first time sea glass hunting. We happened upon a neat piece that had many swirls of color on a deep green piece of glass. I almost stepped on it! 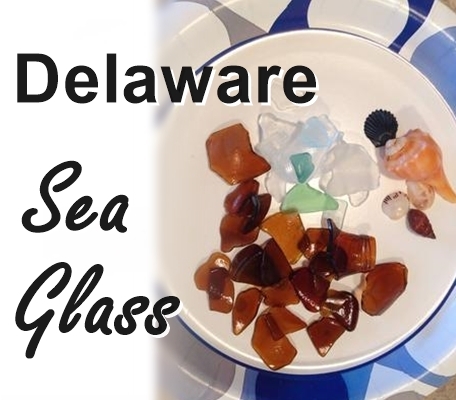 We also went to the North American Sea glass show in Wilmington, DE immediately after our beach walk. We took the piece in to be identified and were lucky enough to get to talk to Sea Glass expert, Richard LaMotte. He was so excited and surprised to tell us that this neat piece was actually from the 1700's and from an old Dutch Onion bottle. It might have even been from a piece of bottle that was used by Royalty, due to the unusual angle of the piece of glass. The swirls of color were from the glass being buried in the mud for hundreds of years. WOW! we were so excited that our daughter found this piece of glass on her first time beach hunting. He said people look their entire lives for such a great find! Woodland Beach has been cleaned up tremendously. I don't know who said it is not safe there, but there is an active neighborhood watch, as well as 24 x 7 commercial presence on site during the season and we have minimal crime. I walk the beach daily and find many pieces of quality sea glass, recent finds include several rare black pieces, as well as several intact prohibition bottles last fall after storms. Remember that this is a popular beach; there are many locals who visit regularly. 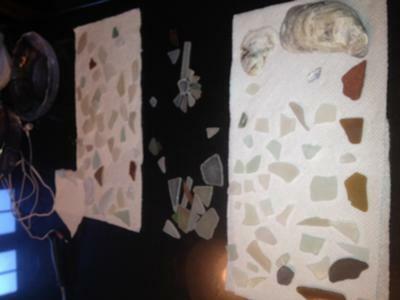 On a recent weekend, at least a dozen people were looking for sea glass or other treasures. The best luck is going to be during the week. Most of the sea glass I've found at Woodland Beach in Delaware is of the same quality as in Ann's pictures, but I have two excellent finds from this beach. One is a bottle neck from the 1800s. The other is an old, 3 inch long nicely tumbled piece of aqua glass. That said, there are the occasional wonderful finds, but most will be unpolished, fairly new window glass, and beer/soda bottle pieces. You need to go at low tide or you cannot get to the area that might be productive. If you just want broken glass that was in water, then this beach will work well for you. Otherwise, it can take many, many trips here to find glass you will keep. There are lots of very sharp, very new broken glass pieces on this beach, so you definitely need foot protection. Join in and write your own page! It's easy to do. How? Simply click here to return to Beach Report and Rating. Found this piece of sea glass on Cape Cod, Massachusetts. Brown glass with the letter ‘S’ inside a Pennsylvania keystone shape. Is this Seaglass, or something else? Found on April 2 2019 at sea shore state park beach in va beach va.
April 4, 2019 Yorktown, Virginia. OdysseySeaGlass relies on advertising to cover costs of sharing sea glass info from around the world. Purchasing from an ad on our site costs no more than directly and provides us with a few cents income. You will see Google and Amazon ads as well a few other advertisers as you view our pages. .